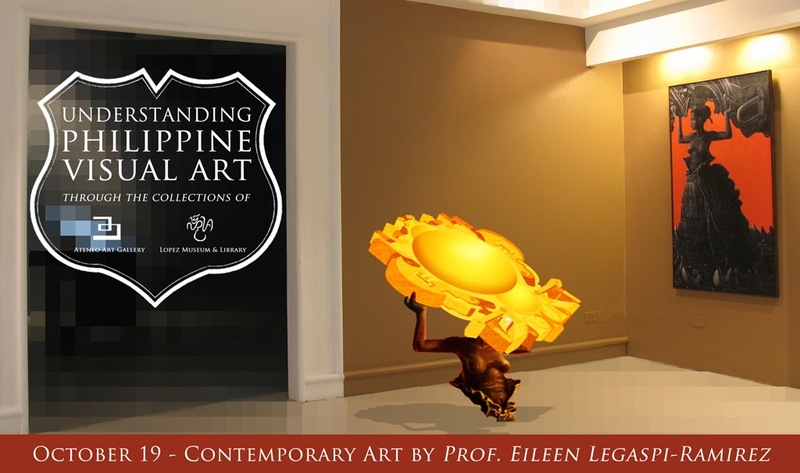 October 19 lecture on Contemporary Art by Prof. Eileen Legaspi-Ramirez. Part of the series on ‘Understanding Philippine Visual Art Through the collections of Ateneo Art Gallery and Lopez Museum’. Eileen Legaspi-Ramirez is an Assistant Professor at the University of the Philippines Department of Art Studies. She was curatorial consultant of Lopez Museum (2005-2012) and is presently a member of the Advisory Board of Asia Art Archive. She teaches courses on art criticism, curatorship,and visual literacy, and was a 2009 fellow of the USA National Endowment for the Arts International Arts Journalism Institute in the Visual Arts. Her writing has appeared in AAA Field Notes, Forum on Contemporary Art and Society, n.paradoxa: international feminist art journal, C-Arts: Asian Contemporary Art and Culture, Metropolis M: Magazine on Contemporary Art, Pananaw: Philippine Journal of Visual Arts, and Ctrl+P: Journal of Contemporary Art, among others. She was a guest curator of the 2011 Jakarta Biennale, and since 1996, has been overseeing the 2012 Alice Awardee for Publications, Pananaw: Philippine Journal of Visual Arts. She is also the Documentation Head of the independent platform, Back to Square Juan/One.